It's January 3rd and hopefully we have recovered from too much celebration, or lack there of. I thought it was time we put 2010 to bed and got started on this year, so feel free to join the chat and show us what you are up to in the rest of the forum. My wife and I caught up on some much needed rest during the holidays, then did some painting. It is quite a change for us to paint in a rested state, without one eye on the clock. I will post some of the snapshots on the In Progress page. I had a great time painting over the holidays. Did a quick painting for a thoughtful friend but forgot to take a photo of it. My husband gave me a great compliment - he says that I have progressed in leaps and bounds over the last few months. that feels great. And something that really has made a difference in my painting is that I am mixing more on my canvas and less on the palette. Dale, that's a great compliment. Your husband sounds very supportive. Supportive - yes. Highly critical - yes as well so it was a compliment. Had a busy family Christmas, followed by a cold spell that I spent wrapped up in blankets, reading. The last two days I spent making a patchwork quilt to take to Oz as a present for my son, made from batik fabric scraps from when I was in Malaysia in 1972. Never made a quilt before, and I'm an anything goes kind of sewer, but it was fun and it looks great to me, so that's the main thing. Almost finished my big painting that I started during my studio show and have worked on and off on since then - will post pics soon. Tried to get on site a few days ago but my password was rejected, today all is good. Glad to be back. Hope everyone had a great holiday season! Glad to see you back. It was a busy season for all of us, but things are picking up again here. I look forward to seeing your progress on the painting. Hi Sofie! I hope your feeling better. It was a very sad day yesterday here in Tucson. Gabrielle Gifford, our congresswomen in Washington, was shot in the head by a 22 year old man from my town using a semi-automatic pistol. 19 were shot and six of those died including a 9 old girl. It happened at the grocery store where my son and family do all their food shopping. I thank God that they weren't shopping there that Saturday morning. My granddaughter and I were driving about 1 mile away when we all had to pull over to let fire trucks, ambulances and police cars go whizzing by. We didn't know what was happening until my son called to tell me to stay away from the area which was now totally shut down. It is a sad day. Maybe it is time for people to stop being so hateful so our children can grow up in love and peace. Sorry if I am so morbid today, but Gabbie, as we all called her, put her whole heart and soul into trying to help people. She didn't deserve this and neither did any of the people injured or killed. Please pray for them. Jduy - it has been on the news here and my heart goes out to families and friends of the victims. In this case - this woman had made such an impact that this reaches many more. I can't imagine the shock everyone must feel. Judy, so sorry to hear about this, especially when it involved people in your own town. Truly tragic. Judy, I believe this news is being shown around the world. We are praying for all the victims and their families. We are all greatly sorry and sad that this has happened. It must be even harder for those of you that live nearby. May God grant you peace, during this hard time. Thank you all. I was really depressed when it happened and needed someplace to vent. She is really a very special person...an example of how all the legislators and senators should be. So far she is holding her own and I continue to pray for her and all those others. I know we are all following this and our hearts go out to all those involved. The new year brought me a burst of (perhaps foolish) ambition. I threw out the grungy sponge and paper liner in my wet palette box, took soap and water to the box, cover and glass palette, and fitted a brand new sponge and liner to the box. Wow, did it look spiffy! I was driven to this by desperation after getting paint on my hands every time I covered or uncovered the palette box. It took me awhile to figure out how this was happening (in actuality I was just avoiding the chore). However, I seem to have washed away some knowledge and good judgment at the same time. My first use of the palette box didn't have too good a result. Guess I'll have to build up both paint and experience in the box again. I did follow Janet's idea and put a penny in the box -maybe that will bring good luck! Jim, I hope the penny works for you. lol I'm sure you'll be back on the write path again soon. OK I missed the penny in the box...someone explain? Dale, The penny will prevent mold in a stay wet palette. Something to do with the copper. Good luck with the studio cleaning. I worked all evening on the studio last night. What a mess. I took down all my paintings that were hanging haphazard on the walls and the place looks so much bigger. I think I may leave them down. It may reduce the distraction from the painting I work on. I am trying to create a sense of peace rather than clutter and busyness. Does that make sense? So now I need to fill all the holes, and paint - get rid of the yellow and put on a light neutral color. I will post photos when I am done. Major snowstorm here last night. I love my hubby who cleaned off my car and cleared the driveway so I could get to work. And I hoped it would bring good luck (like a penny in your shoe) . However, that may be a myth. The tally so far: (1) first attempt to calibrate my printer -abysmal failure [don't know why], (2) stretching a canvas using recommendation to heat and lightly spray back of canvas first -flaps in the breeze, (3) modifying sky color under-painting in a new painting -yuk. hmmmm. Maybe I should have used a "loonie" (Canadian dollar coin). My sense of humour. Ya gotta a kid that's bawling and screaming. Don't pass this charity shop window. Call in and change it for a new one. Special bargain price!!! Okay, that's it; no more cleaning my palette box !! Today my printer and computer are having a spat. They don't exactly handshake - it's more like a hit "upside-the-head" and then they ignore each other. The printer must not like my (still unsuccessful) attempts to calibrate it. And my attempt to re-stretch the canvas didn't work either. Years ago a relative sent me a lucky loonie. Guess I'd better start looking for it. Kopo; is that typical Middle Earth England humor ? 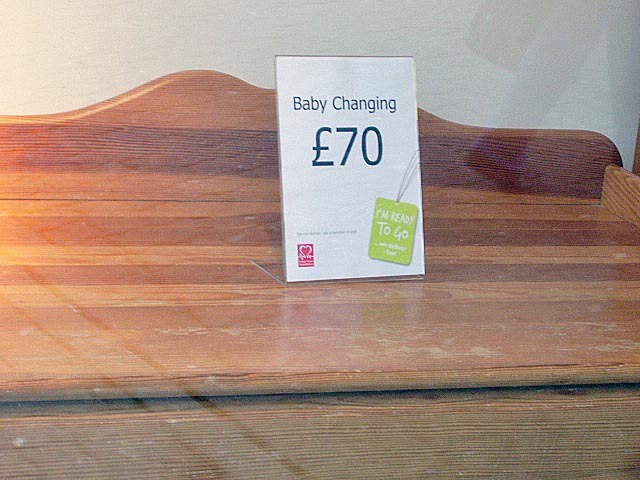 A baby-changing, life changing event? I like your humor. Good to hear from you again. One week from today I'll be in the air on my way to Oz - can't wait!